In case you didn’t notice, the NFL started up yesterday, and a hot topic around these parts, given our readership — Bears vs. Colts — went about as well as I could have possibly imagined. It doesn’t much make up for that Colts Super Bowl win, but it feels good all the same. “I look back at it out now, and I wish to a degree, that I would have said, ‘Hey, do we need to play this team or that team?’ Contracts were done, you know, it was one of those situations where there was so much going on, the schedule was it was going to be. It’s the way that it is. There’s no way you can say no to this. I don’t think you can. 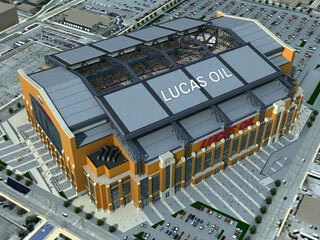 It would really, really be a bad feeling to be sitting at home and watching somebody else open Lucas Oil (Field). That had to happen, the Kentucky game was gonna be there. Do I wish we were at home for an ACC game? I do, but that’s not the way the schedule works, they had a home game last year. Maui, you know, as much as we’re going to be challenged in that, how do you not take your kids to Maui? They have to understand three things, really. No. 1, they’re part of an incredible tradition, there’s no doubt about that. They don’t totally know what that means yet, but they’re learning it. No.2, they’ve got to come in and they’ve got to get used to college life. They’ve got to come in and get used to what it means to an Indiana basketball player at a school of 38,000. The one place where it’s been good for me is that my tendency is to go fast, teach the whole and then add the parts as we go, really try to get that tempo. When you have a veteran team, when you have players that have been around, even when we had the young guys at Marquette and we knew they were gonna play Jerel McNeal, Dominic James and Wesley Matthews, we still had a guy like Steve Novak, who’s in the NBA. We still had a couple of seniors. We don’t have that now, so we have to go really slow, and that’s good. I think Tim Buckley does a good job of keeping me in line on that making sure that we’re not moving too fast. The Colts look like they were still playing in the pre-season. They did not have much motivation and preparation going into the game. From Dungy and the players, they looked very lousy. Full disclosure, I only watched the first half. Although giving up 29 points to the Bears is bad, at least in the first half it looked like a normal Peyton Manning would have made a huge difference in the game. He missed a few receivers, including Wayne for a first half touchdown, by inches. Peyton in a week or two will be precise again. Scoring 7 on those possessions would have made this an entirely different game. it's not late for you guys to convert to Giants fans. As an Ambassador I would be happy to grant visas to join our club. This only applies to hoosier basketball fans. So how about it? He… He……. I thought this was a basketball blog. LOL! does anybody know anything about a kid named bawa manuri? my friend who lives in greensboro, nc called me and said that he was just offered a schollie from IU. Is Christian Watford ready to commit?